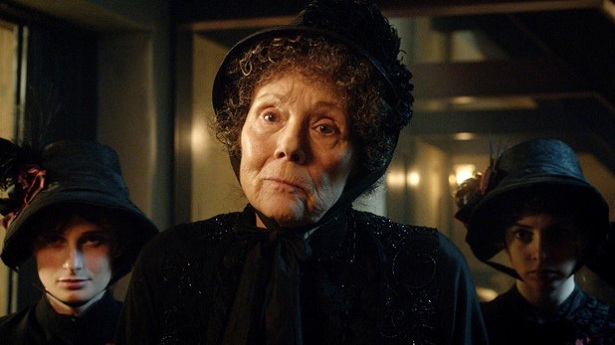 Gillyflower, Conan Doyle and The Crimson Horror (2013) | Randomwhoness: a Doctor Who blog by Johnny Spandrell. Sampling stories in random order. CONAN DOYLE: So Mrs Gillyflower. Thanks for agreeing to this interview. GILLYFLOWER: You’re very welcome, Mr Conan Doyle. CONAN DOYLE: Tell me about your wicked plan. It will be most excellent research material. GILLYFLOWER: With pleasure. You see, I am a prize winning chemist and mechanical engineer. CONAN DOYLE: Unusual dual careers for a woman in 19th Century Yorkshire. CONAN DOYLE: Um, doing what exactly? GILLYFLOWER: Never you mind. But while I was down there, I came across this fascinating red leech. GILLYFLOWER: Well, maybe to you. But I immediately recognised it as something unique so I captured it and took it home. CONAN DOYLE: Well of course you did. Who would do anything else? GILLYFLOWER: Upon examination, I deduced it to be an ancient lifeform, a survivor from the dawn of time! CONAN DOYLE: Wait, did you say you’re a zoologist? GILLYFLOWER: No, I am a prize winning chemist and mechanical engineer. CONAN DOYLE: I see. So what did you do with this leech? GILLYFLOWER: Well, I discovered that it secreted a deadly organic poison. CONAN DOYLE: How did you do that without being infected? GILLYFLOWER: Because I’m a prize winning chemist. Anyway, when I discovered that the poison was deadly enough to kill everyone in the entire world, I saw the potential for it to facilitate a grand scheme I had. Namely to kill everyone in the entire world. Save for a select group of beautiful young people. CONAN DOYLE: Why did you want to kill everyone in the entire world? GILLYFLOWER: Y’know, I’m not at all clear on that. Something about moral turpitude and Bradford being like Bablyon. CONAN DOYLE: Ok, so about this select group of beautiful young people. GILLYFLOWER: Yes, of course. So I discovered that a dilute form of the poison could in fact temporarily paralyse and preserve human beings. CONAN DOYLE: Because you’re a prize winning chemist. GILLYFLOWER: That’s right. Incidentally, it also altered the human body’s chemical composition so much that a person’s last view of the world before death is imprinted on their eye! CONAN DOYLE: It does a lot of things, this miraculous substance. GILLYFLOWER: Oh yes. And I had by this stage also developed an anti-toxin to immunise myself. GILLYFLOWER: Oh, nothing so vague, young man! No, because I had experimented on my daughter with the venom. CONAN DOYLE: Oh. Presumably you could have chosen anyone to experiment upon. Why your daughter? GILLYFLOWER: It was necessary! Don’t you see? CONAN DOYLE: Not really. And what sort of toxicology experiments result in terrible facial scarring? CONAN DOYLE: Where did you get the money to set up this community? GILLYFLOWER: Dipping them in vats of the diluted poison. CONAN DOYLE: All that from one leech? GILLYFLOWER: DILUTED poison, are you deaf? CONAN DOYLE: Of course. And it worked every time. GILLYFLOWER: No. Into the canal with the rejects! CONAN DOYLE: Didn’t people notice when bright red corpses started popping up in the river? GILLYFLOWER: Yes! But I didn’t worry about being detected. For some reason. CONAN DOYLE: And the preserved people… didn’t their friends and family come inquiring about them? GILLYFLOWER: Once. But we pushed him into a vat of poison. CONAN DOYLE: Right. So the plan is to let the beautiful people sleep while you kill everyone else with the poison. How does that part work? GILLYFLOWER: I’ve built a rocket! CONAN DOYLE: In 19th century Yorkshire? GILLYFLOWER: How many times do I have to tell you? I’m a prize winning chemist and MECHANICAL ENGINEER! The rocket will explode in the atmosphere, and poison the whole world. CONAN DOYLE: Wait a minute – the world’s a big place. How does exploding one rocket spread this substance over the whole planet? GILLYFLOWER: It just will, all right? GILLYFLOWER: We’ve got this all planned out, we’re just not telling you! CONAN DOYLE: Right. One final thing. GILLYFLOWER: I should think so too! CONAN DOYLE: This utopian community – Sweetville? Where’d the name come from? GILLYFLOWER: From my silent partner, Mr Sweet. That’s the name I gave the red leech. CONAN DOYLE: You don’t seem like the sort of person who gives exotic poisonous parasites pet names. GILLYFLOWER: I bet I don’t seem like the sort of person who allows said parasite to attach itself permanently to her breast either. CONAN DOYLE: Interesting plot though. A very dark and queer business. It reminds me of.. have you ever seen The Avengers? GILLYFLOWER: I don’t know what you’re talking about. NEXT TIME: You embarrass me! But still, please be my plus 1 at The Wedding of River Song.